Born: 22 March 1866, Magelang, Java, Indonesia. Died: 13 March 1954, Pretoria, South Africa. Christoph G.S. Sandberg was the son of Jonkheer (and Major) Johan J. Sandberg of the Royal Dutch East India Army and his wife Marianne Bergemann. His title "Jonkheer" indicates that he was a member of the Netherlands hereditary nobility.Young Sandberg studied at Leyden, the Netherlands, and in France during 1877-1888 and in 1889 arrived in the South African Republic (Transvaal) to become a clerk in the State Secretary's Department. In 1890 he was appointed as a claims inspector, first on the Witwatersrand and then on the Selati gold fields (in present Mpumalanga). From 1894 to 1899 served as clerk in the External Affairs Division of the State Secretary's Department and as secretary to State Secretary Dr W.J. Leyds and later F.W. Reitz. On 7 January 1897 he married Wilhelmina E. van Mansveldt, with whom he had two sons and a daughter. During the Anglo-Boer War (1899-1902) he held various positions under General P.J. Joubert and General L. Botha and in July 1900 led a confidential mission to Leyds in Europe. He subsequently led a pro-Boer propaganda and fund-raising campaign in France. After the war Sandberg studied at the Sorbonne in Paris, where he was awarded a doctorate in June 1905 for a geological study in the Swiss Alps, �tudes g�ologiques sur le massif de la Pierre-�-voir (Bas Valais) . He returned to South Africa in 1906 and for the next three years worked as a consultant geologist in Johannesburg. During this period he published a number of contributions to South African geology. These included "Notes on the structural geology of South Africa" (South African Mines, 1907); "Tectonical remarks on the probable big Tygerberg inverted fold" (Transactions of the Geological Society of South Africa, 1906), and a paper on the same topic in the Geological Magazine (1908); "Petroleum prospects in South Africa" (South African Mines, 1907), in which he predicted that oil would be discovered in the Karoo; and "The age of the 'Old or Gray Granite' of the Transvaal and Orange River Colony" (Geological Magazine, 1908). In 1906 he was a member of the Geological Society of South Africa. That year he also joined the South African Philosophical Society and remained a member when it became the Royal Society of South Africa in 1908. He was also a member of the Geological Society of France, the Mining Society of France, and the (British) Institute of Mining Engineers. In 1910 the government of the Netherlands sent him to the Dutch East Indies (now Indonesia) to investigate the geology of the islands Sumatra, Borneo and Sulawesi. 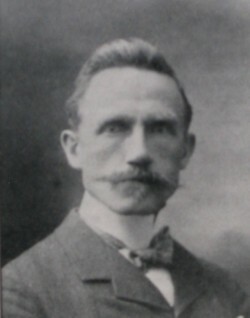 He returned to the Netherlands in 1913 and worked as secretary to the directors of the firm Lindeteves of Rotterdam until his retirement in 1922. Meanwhile he continued his geological research and published a comprehensive work on geodynamics in German, titled Geodynamische probleme (2 vols, Berlin, 1924). Some of his papers related to South Africa, for example, "On the probable origin of the members of the Bushveld Igneous Complex (Transvaal)" appeared in the Geological Magazine in 1926, followed by another (in German) on the structural geology of the Bushveld Igneous Complex and the Vredefort Dome in the Zeitschrift f�r Vulkanologie (1927). Two further papers on the origin of the Dwyka Conglomerate of South Africa appeared in the Geological Magazine in 1928. Before and during World War 2 (1939-1945) Sandberg was active in the Nederlandse Nationaal-Socialistische Beweging (Netherlands National Socialist Movement) which supported Hitler's Nazi Party. He wrote a booklet, Suid-Afrika en wij (South Africa and us; Leiden, 1941) dealing with the history, politics and government of South Africa and its relations with the Netherlands. In 1943 he published an autobiographical work, Twintig jaren onder Krugers Boeren in voor- en tegenspoed (Twenty years among Kruger's Boers in prosperity and adversity), based on his experiences in the Transvaal. In 1951, after the death of his wife, he emigrated to South Africa and settled in Pretoria. Hall, A.L. Bibliography of South African geology .... Pretoria: Geological Survey, Memoirs No. 18 (1922), 25 (1927), and 27 (1931). South African Philosophical Society. Transactions, 1906-1907, Vol. 16, 17, lists of members. Staats-almanak der Zuid-Afrikaansche Republiek, 1896, p. 72.